Returned to OpenRA to share some screenshots of a fun project I'm working on. 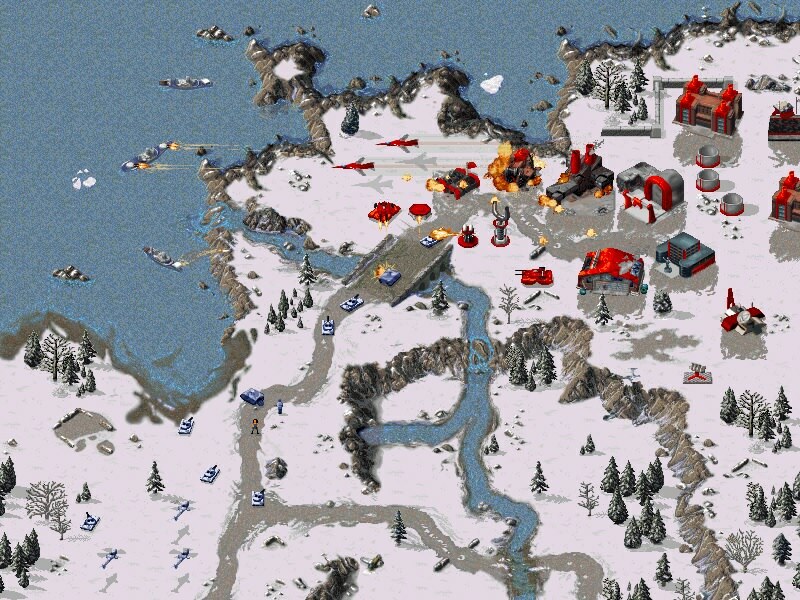 I tried recreating areas from a promotional image for Red Alert 1 in OpenRA's map editor to see if it was possible and the results came out pretty well. 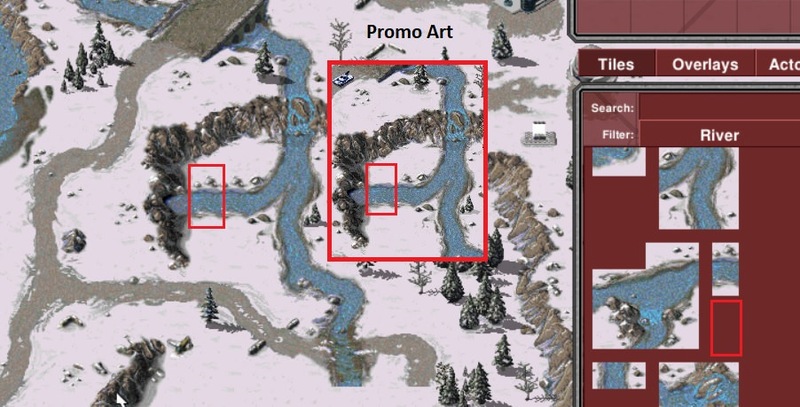 I was actually surprised by how little the snow tile set changed from the promo image to the final version of the game (and OpenRA). The only 'obvious' difference is the beach tiles in the lower left corner. While a lot of the slight differences in object placement can be ruled out as doctored special effects (explosions on vehicle surfaces based on where they originated from, jet streams, etc), the beach tiles used by the lower corner of the promo image are actually impossible to replicate. The tile piece that would fit in the spot is actually several tiles larger that the version in the promo image. Considering how there's still TD Communication Centers in the place of the Radar Dome, its possible that the time was updated after the time that the image in question was published. 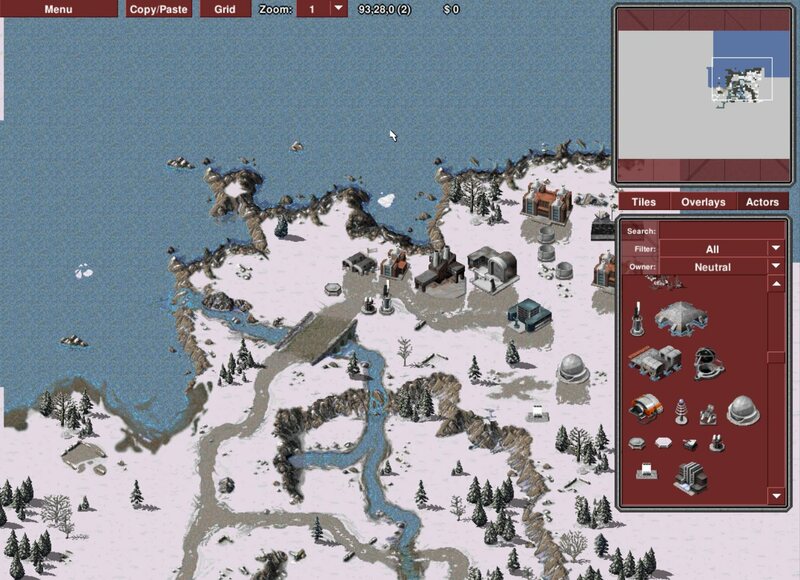 I also noticed that there's actually two different 1x2 river tiles for subtle variety that aren't present in OpenRA. 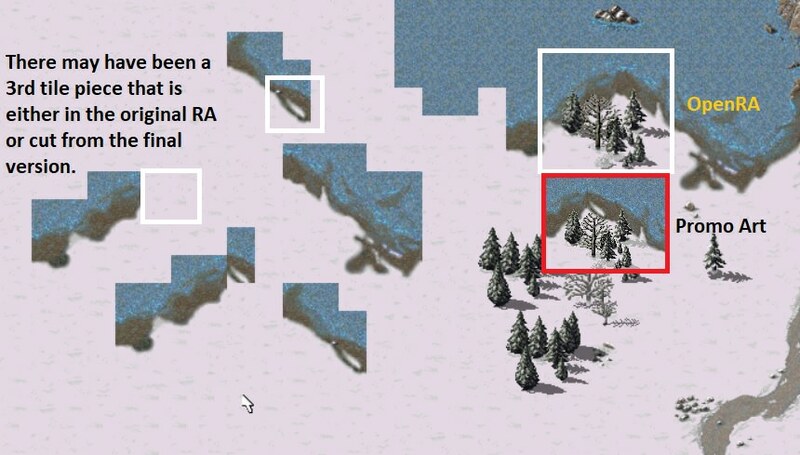 I don't remember if this was the case in the original RA (since its been ages since I last checked) but, maybe a second 1x2 river tile could be added for variety. One other difference is the shadow intensity from the promo image (as well as in the original game) when compared to OpenRA. This is just a subtle difference though. These are just a handful of little things that could tweaked in OpenRA that aren't exactly of any real priority because of how subtle they are but, I digress. Getting back on-topic, my goal is to make a skirmish map out of the area from the screenshot. Due to how small the area is, I might try melding multiple promo/pre-release screenshot locations into one medium sized map. The working name for the map is, "Forgotten Shore".